It is a gift and a challenge when a person who is in their own 12 step recovery also gets to work in the field of addiction with other recovering addicts. From my perspective, it can be challenging to separate my own recovery from the work I do on the job. As a clinician, my focus is on the clients I work with and making sure they learn how to stay sober and use the 12 steps of Alcoholics Anonymous to support their recovery. Since I have my own experience as a recovering alcoholic, and I have a very good understanding of how the 12 steps can help a person stay sober, it is easy for me to pass this information along in a way that the clients can easily understand. When a client talks about how “12 step programs don’t work” or that they feel as if they have tried the program and found it wanting, I can easily point out several success stories and self disclose my own long term recovery to help them see a living example of success based on the 12 step principles that we at Canyon Crossing are encouraging our clients to embrace. This is the gift I can give to my clients since I’m working a program of my own. The challenge comes, when as a clinician, I can’t separate my own program from the program that I am asking a client to integrate. When I think, “I did it this way so they should too”, I need to take a step back and remember that every person has their own journey with the 12 steps and my clients will have their own journey that may not look exactly like mine. When this occurs I can use the Al-Anon 12 step program to practice detachment. Al-Anon teaches a person how to love the person and separate their disease from the person they are. It also teaches how to lower your expectations and meet a person where they are instead of wanting them to be where I think they should be. I am a better clinician because I have integrated my own 12 step program into my life and live by the principles of the AA and Al-anon program. I am also very satisfied in my work because I’m doing something that I believe in and doing meaningful work is very important to me. I also practice my program outside of work in order to stay as healthy as I can be which enhances my ability to work with the women who need positive supportive role models of recovery. 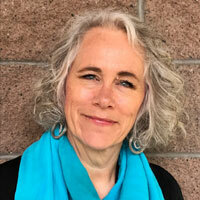 I’m new at Canyon Crossing and have been working in and around the field of addiction treatment since 1986. I am a trained EMDR therapist and am presently enrolled in a master’s degree program to become a Licensed Marriage and Family Therapist. I find that a 12 step foundation enhances all of my education and allows me to be the very best clinician I can be, but working in the field of addictions does not take the place of the service work I need to do in my own program. It is a gift to work with this population and I enjoy sharing my own experience, strength and hope while maintaining my professionalism.